The story of how this Dr1 came to be where it is today is a very compelling one, to say the least. Now that we have toiled for the past 25 years to get this aircraft back into our Family, this Dr.1 will be enjoyed for future generations. Here is a video taken from a user on Youtube, filmed during the 2010 display at Chino Planes of Fame airshow- incidentally, the aircraft was taken from a storage lot 25 years ago 200 yards to the rear of where it is shown here. Being one of two Dr1 Triplanes built by Bitz Flugzeugbau in Germany in 1964 for the film industry, it rapidly became highly popular and well recognized as one of the stars of many classic aviation movies like The Blue Max, Von Richtofen and Brown, and others. The fleet of World War One replicas, owned by ex-RCAF fighter pilot Lynn Garrison’s “Blue Max Aviation”, was based at Baldonnel before being moved to Weston Aerodrome at Leixlip. 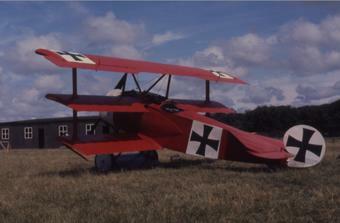 This Fokker Triplane was one of two examples built for the film industry in 1964 by Bitz Flugzeugbau. 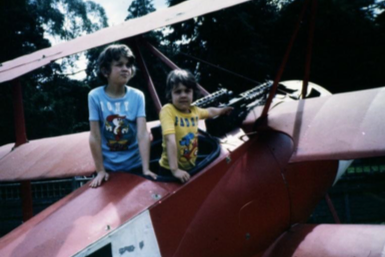 The aircraft was part of the author’s “Blue Max” collection, and appeared in such films as The Blue Max and Von Richthofen and Brown before it was stolen in 1978. Over the last 30 years, the machine has amassed an amazing history that included two thefts and decades of neglect, before it was permanently returned to its original owner in 2009. This photo was taken in Ireland in 1978. Unlike a wedding anniversary, there are dates that remain riveted in your memory, forever. October 15, 1978, is one such moment in time. Sunday morning was one of those “soft days,” as the Irish called them; hours of steady drizzle from a solid overcast. This particular “soft day” had been with us for a week, with no end in sight. One of those Atlantic depressions was stuck over the island, waiting for another destination. I had decided to remain indoors, working on an article for Air Progress when the phone’s two-tone ring interrupted my concentration. Before I could say hello, a frantic voice, at the other end of the connection squeaked…”Someone‟s stolen the Triplane!! !” Since my crew was prone to making jokes, I didn‟t take the comment seriously until the details were explained. Sometime during the night my hangar at Powersourt Estate, just outside of Dublin, had been broken into. 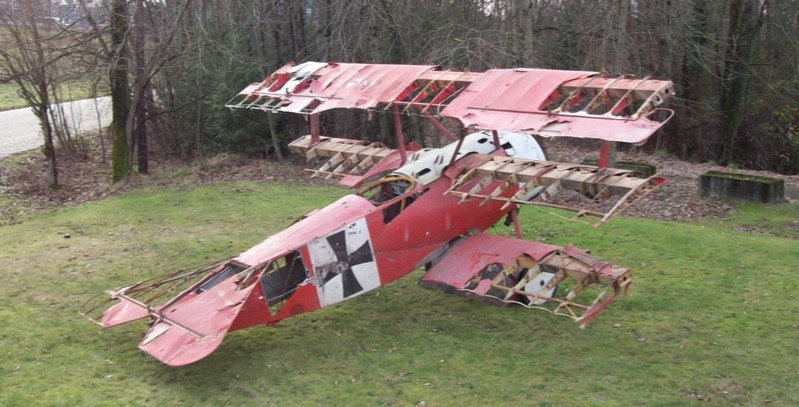 My Fokker Dr.1 Triplane had been broken down for transport off-site and removed. My engineer had already informed the authorities, and they were on the way. Air Progress was forgotten as I made the 20 minute drive to Powerscourt, a beautiful estate that had been the residence of Oliver Cromwell when he was suppressing the rebellious Irish between 1649 and 1653. It was now home to the Slazenger family, of sporting goods fame. The entire Slazenger family was involved with aviation and welcomed my film operation to their facility, which had a very nice grass field. My two hangars were nestled beneath some mature trees at the end of this strip. As a side comment, Frederick Forsyth, who wrote Day of the Jackal, Odessa File and Dogs of War lived right at the end of our takeoff path. Forsyth had been an RAF pilot in 1954, when I was flying with the RCAF, so he would spend his spare time with our aircraft. 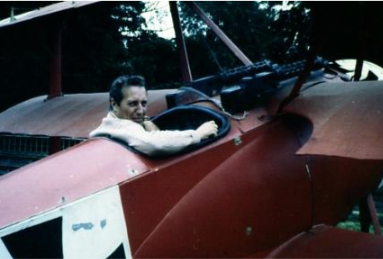 Famed English author Frederick Forsyth seated in the author’s Fokker Triplane. As I drove towards the problem, I thought back over the events that had brought me to this point in time. My first thoughts were of the memories of a being a small boy growing up during World War II which, to my young mind, was just one big adventure, full of exciting aircraft. My hometown of Calgary, Alberta, was the center of the British Commonwealth Air Training Plan, which turned out something like 150,000 aircrew for service overseas. My family hosted aircrew trainees during their fortnightly leave, and I became hooked on aviation. My one goal was to fly, and during March of 1954, I set out along the path that had finally brought me to Powerscourt Estate in the mid-seventies, having transferred my operation from an earlier base at Weston Aerodrome, Liexlip, Ireland. Powerscourt became a second home for my two sons, Tony and Patrick, both of whom have retained a deep interest in aviation. The author’s sons, Tony and Patrick, in the cockpit of the Triplane. I flew for 10 years in the RCAF and started to collect aircraft, scattered around the countryside as leftovers of the war. 1965 saw me in California for a project, and I soon became involved with the folks that were producing The Blue Max. 20th Century Fox had accumulated a sizeable collection of aircraft for this production, backed by everything else – such as uniforms and period vehicles. I purchased these and, among other things, found myself the proud owner of two replica Fokker Dr.1 Triplanes, constructed by Joseph Bitz in Germany. Bitz designed the Bucker Jungmeister and Jungmann. In 2011, Bitz Flugzeugbau still exists. The Triplane became one of my favorites after I mastered its eccentricities. It lacked many of the subtleties found in most aircraft, but had some special traits of its own. With the Siemens SH-14 radial, it had plenty of power and would bounce into the air within a couple of hundred feet. Flying off a grass strip had its advantages. You could just point into the wind and go! This avoided the problems involved with crosswinds. It also reduced the problems of steering the Triplane on the ground. The tailskid maintained a drag which allowed some control. Try and taxi this aircraft on pavement, and you will know what I mean. It just goes around in circles. In general, the control feel was similar to that exhibited by a Link Trainer. These were the thoughts that transited my mind during the 20 minute drive to Powerscourt. I pulled into the parking area and left my car next to that of the Garda Siochana, Ireland‟s police. A Superintendent was already inside the hangar, looking at the floor where a few pieces of the missing aircraft remained. It was obvious that the thieves had used bolt cutters to facilitate their crime. Tracks from their vehicle had left indentations in the grass. I managed to keep the investigation alive by suggesting that some IRA fanatic might put rockets on the aircraft for an attack of Stormont Castle in Northern Ireland. The seventies hosted many problems in Ireland and an attack on Stormont, home of Northern Ireland‟s parliament, would be a major, unwanted event. All leads were exhausted, with absolutely no result. Early that Sunday morning a milkman had observed the Triplane being towed along the road, perched on a trailer. Fokker Dr.1 Triplane EI-APW had simply ceased to exist in a country where there were no secrets, if one waited long enough. Patience would see someone talk. But, in this case, patience did absolutely nothing! Above: Aircraft of the Blue Max Collection photographed in the mid 1970s. In addition to the Triplane are a Pfalz D.III and Fokker D.VII which are now part of a collection in New Zealand, as well as a 7/8 scale Slingsby S.E.5a, which has just returned to the Blue Max Collection and is currently being restored. Above Left: The Triplane seen on set during the filming of The Blue Max. The aircraft appears in red for the scenes when Manfred von Richthofen visited the movie’s main character (Bruno Stachel) played by George Peppard. 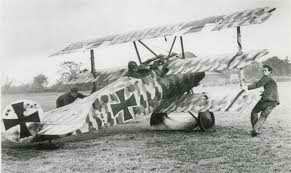 Above Right: This Triplane was also used in the movie’s famous bridge storming scene, where it appeared in lozenge camouflage. 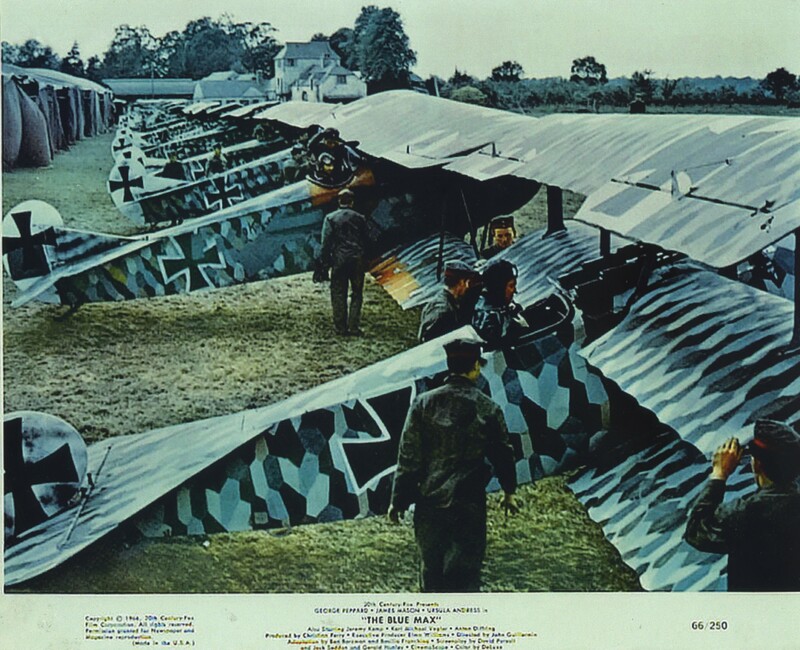 Above Left: An additional view of the Triplane in lozenge camouflage during the filming of The Blue Max. Above Right: The Triplane during the filming of the 1970 Rock Hudson / Julie Andrews drama Darling Lili. The police worry turned to disbelief as no word of the machine came to them through their very efficient network of informants. No one boasted of the theft. In 1979 I returned to California in an effort to put a TV series together with the Hawaii Five-0 team. Time passed and EI-APW was forgotten. On December 1, 1981, I was wandering through a supermarket and stopped at the magazine rack to leaf through the latest Air Progress. To my amazement, in the centerfold, was an ad for the Wings & Wheels auction in Orlando, Florida. Featured on this ad was a photo of my Triplane, easily identified by a special panel behind the cockpit for the mounting of camera equipment. The auction was being coordinated by a director for a well-known auction house. I knew the director, who was a collector of aircraft and owned a Spitfire. He had tried to purchase one of my Fokker D.VIIs but wouldn‟t meet my price. The auction was scheduled for December 6, which left little time. 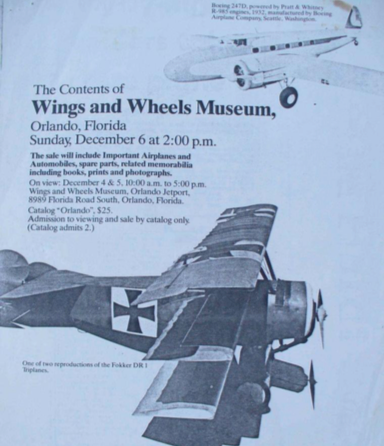 The ad for the Wings & Wheels auction, featuring the stolen Triplane. another old aviation friend, and I received a promise to supply a bond, in whatever sum I might need. A flight to Orlando, a quick appearance before a judge who was also intrigued with this crime, and we had a document that effectively short-circuited the Constitution. It allowed us to take possession of the Triplane before any legal action was initiated. The sheriff was also intrigued with the situation and personally drove me to the huge former-Strategic Air Command hangar where Wings & Wheels had been located, now the focus of a major aviation/automotive auction. Their entire collection was there, along with items offered by others. At any other time, I would have gladly wandered around the space, looking at the countless marvels gathered there. Instead, I was now closely following the sheriff as he made a beeline through the displays to where Triplane EI-APW sat – squarely in the middle of the vast space, tightly surrounded by other treasures. The director arrived and said hello to me just as the sheriff handed him papers giving me immediate possession of the Blue Max Triplane. He ordered – and that‟s the word- ordered him to remove the aircraft and place it outside the hangar – immediately!!! The director was flustered, and blustered, saying this was unsportsmanlike. I pointed out the fact that he should have known the aircraft came from my collection and could have called me. Moving my Triplane out of the hangar presented a major logistics problem. The sheriff finally agreed to leave the aircraft in the middle of the auction, provided that one of his deputies would remain with it and the documents were to be taped to the fuselage. A police investigation would finally reveal the bizarre case that saw the Director of an U.S.-based foundation underwrite the theft and removal of the aircraft from Ireland. The Triplane was hauled away on the trailer spotted by the milkman, and stored in another American‟s warehouse for almost a year. It was then shipped to the States where it became a part of the foundation’s collection. The man died, and that was why the aircraft ended up at the auction. After the auction was completed, I loaded the bits and pieces on a trailer and hauled it back to Chino, California, where I placed the load behind my friend Bruce‟s hangar. I had known Bruce since the mid- sixties, when he stored my Corsair at the Monterey airport. He had moved to Chino where he became the foremost rebuilder of classic fighter aircraft. There it sat, waiting for the time when I could focus upon its rebuild. I had offered it to a museum in Alberta but had not received an answer. In 1991, I was asked to assist the Haitian government as it was faced with an international embargo. This absorbed my time from August 1991 through October of 1994. During this period, Bruce’s smoking had finally caught up with him and lung cancer took another friend. At some point, the Blue Max Triplane began another voyage into the unknown. I returned to Los Angeles and discovered it has disappeared – again!! I left California and based myself in Florida, as the closest access to Haiti. My life now revolved around Haiti and its troubles. Once again, the Blue Max Triplane became another one of those foggy memories buried in the recesses of my mind. From time to time, we would type “Bitz Fokker Dr.1 Triplane EI-APW” into the Google search engine, with no tangible results, other than to tell me what I already knew. “The story as I’ve been able to gather is that the plane was brought out from the LA area to a fellow in the Inland Empire area to have some work done. The fellow who did the work was then unable to contact the owner. After storing the plane for several years he moved and took the plane with him. After several more years and still unable to contact the owner, he was going to move again but didn’t want to move the plane again. That’s when he dropped it off at Flabob. As you can see, it’s a bit of a mystery plane. Maybe something from the movie industry? We replied that there was a missing Triplane. The process began that saw our aircraft returned, and more friends created. It seems as though someone took the Blue Max Triplane from Bruce‟s place while I was in Haiti, and somehow became involved with a concept to rebuild it. The facts are very vague, but the Dr.1 was abandoned in some hangar, and he dragged it around with him after his business collapsed, hoping the owner would reappear. In the process of a home sale, the aircraft was discovered and the folks at FLABOB airfield were invited to come collect the remnants. Flabob is well known as the center of light aviation where many great concepts have been born. The Flabob people gave the aircraft shelter and there it remained, gathering dust among other mementos from the past – an old motorcycle, an antique gasoline pump from an earlier time before digital electronics, a wire-spoked wheel from an unknown machine. Mark Lightsey was the magical connection between the past and present. He had just completed an exquisite Caudron racer and was looking for a new challenge. Flabob had preserved his next possible challenge. Without Flabob, the Blue Max Triplane would have probably been trashed – totally. We should take a brief look at how FLABOB has survived as the focus of aviation. In 1999, Tom Wathen retired as chairman of an international security and detective firm, and set out to fulfill his longtime plan to devote his time and his resources to charitable activities. With the help and advice of friends, he determined that his Wathen Foundation would be dedicated to aviation education and preservation. It quickly became apparent that the Foundation needed a facility for its work, in effect a “campus” where teachers, volunteers, young people and others could get together. Knowing that Flabob Airport had long been for sale, Wathen thought it might be a good site for the Foundation’s work. When the Wathen Foundation inquired early in 2000 if Flabob was still for sale, it was told that it was too late, as an offer to purchase the land for non-aviation development was far advanced. Fortunately, when the family owners realized that the Wathen Foundation was serious in its interest of purchasing and preserving Flabob, they gave their enthusiastic support and cooperation to the effort. On May 31, 2000, the Wathen Foundation completed its purchase of Flabob Airport under the ownership of the Wathen Foundation. Now John D. Lyon, Flabob‟s executive director, would speed the process along. Documents were passed back and forth. Soon my son Patrick was on his way to California with a vehicle/trailer combination for the final step in Fokker Dr.1 EI-APW‟s recovery from its second disappearance. The Blue Max Triplane is now registered as N-403BM – the 403 standing for 403 City of Calgary Squadron, RCAF, and the BM for Blue Max Aviation. I can remember the rule of thumb we used in our film projects when trying to explain the challenge of building an aircraft from scratch. We would say that 1,900 hours were required, therefore, the aircraft could be ready by next weekend, or even the month‟s end. That is with the benefit of deep pockets, open budgets, and few distractions. Patrick is starting ahead of zero, but much is left to be done along the way before the 1964/65 Bitz Triplane takes to the air again. Other aircraft are being tracked down simultaneously, and some are being re- acquired. All of the original parts for the Blue Max Triplane have been located, with the original rudder being located in a collection in Texas, and the original twin Spandau movie guns being located in a collection in the Pacific Northwest. 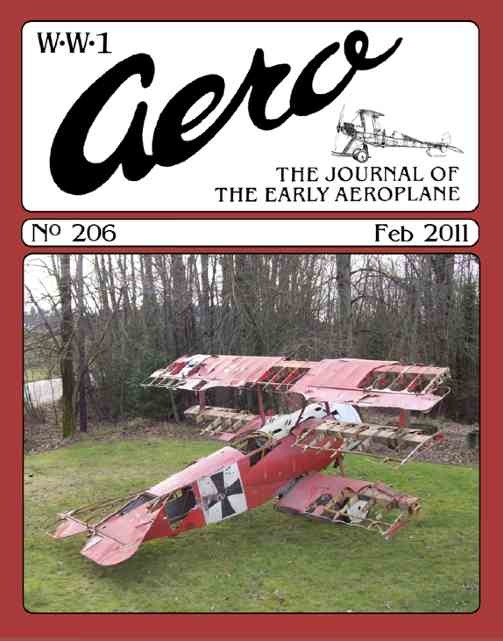 The Triplane in its current state, photographed on December 18, 2010. 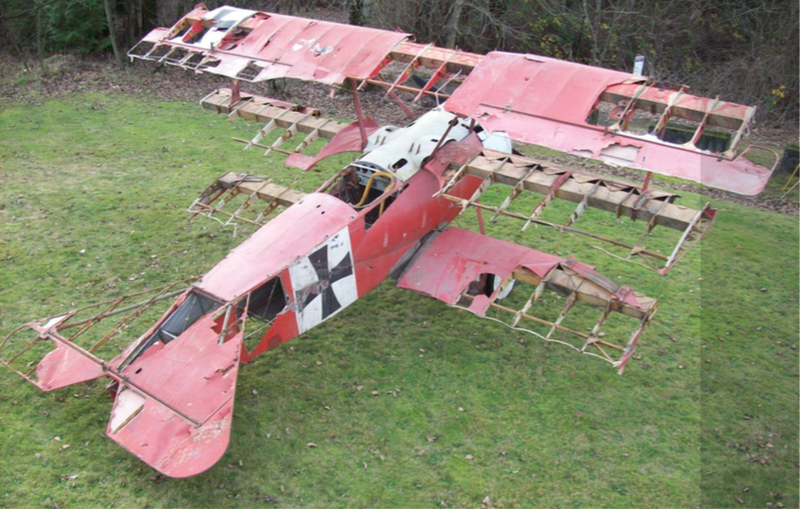 Roughly 1,500 hours of work will be required to return the Triplane to airworthy condition. In the search for the remaining birds from the former Blue Max Collection, we have located a pair of the 7/8th scale R.A.F. S.E.5a reproductions from the filming of Darling Lili, Zeppelin, and Von Richthofen and Brown, amongst many others. Now, the Blue Max Triplane has at least one old friend coming to live by its side in the hangar here at home, where they belong for the next few generations, and for all of the airshow attending public to enjoy. If you wish to discuss these exceptionally influential aircraft, or have aspirations to participate in the restoration, please do contact us at bitztriplane@gmail.com. Above: An additional view of the Triplane, photographed on December 18, 2010. The team has a complete set of drawings for the aircraft and has been offered manufacturer’s notes and manuals for the engine. They will be posting updates as restoration proceeds and will also be offering photographs, t-shirts, posters, as well as pieces of the fabric and wood rib sections, with all proceeds benefiting the project.